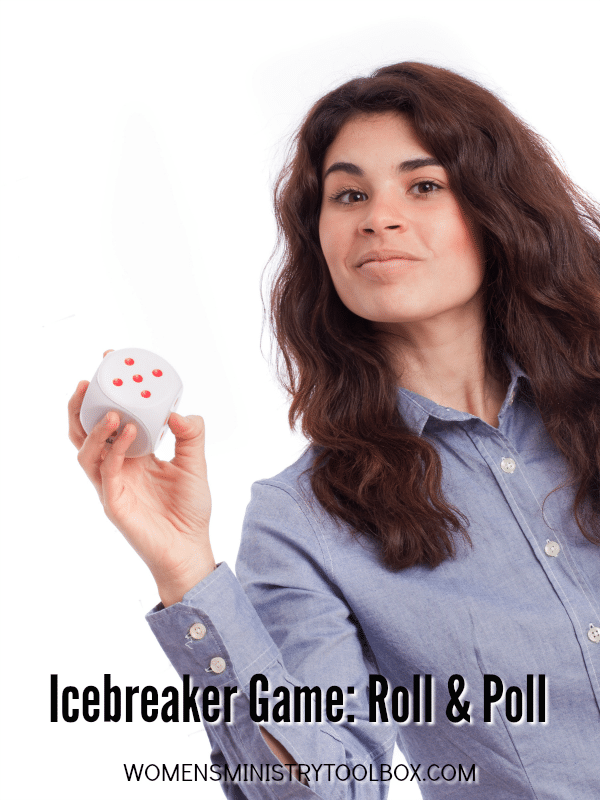 Roll and Poll is a great icebreaker game for small and large groups! It’s never the same game twice! Three different versions of Roll and Poll offer a choice of fun or spiritual questions. hat aspect of your daily routine do you look forward to the most? If you could add a new room to your house, what would it be? You’ll find a complete list of questions of each of the three different versions at the bottom of the post. Instructions: Gather a couple of volunteers to distribute one playing card and one dice per group/table. Say: Tonight we’ve got a quick and fun icebreaker to play. Each woman will need to take a turn rolling the dice and answering the corresponding question. You’ll have 10 minutes to for your group to complete the game. If time, have everyone roll two twice. Packs of regular (and sometimes giant foam) dice can usually be found at the Dollar Store. Laminate the cards for repeated use – it’s a different game every time. Pick the version that best suits your audience. I do not recommend you use the Bible version in any group that may have guests and/or new Christians. (You may want to read my post on Why I Don’t Do Bible Games.) Instead use the Bible version for your leadership team meetings. Questions in version 1 include: If you could rid the world of one thing, what would it be? What is something you have that is of sentimental value? If you had one extra hour of free time a day, how would you use it? What one thing (modern convenience) could you not live without? If you could add a new room to your house, what would it be? If you could have any view in the world visible from your bed, what would it be? Questions in version 2 include: What is the weirdest food you have ever eaten? What was the last song on your playlist (or what CD is in your CD player)? If you joined the circus, what act would you most want to perform? What aspect of your daily routine do you look forward to the most? What is your favorite day of the year? What do you keep in your wallet besides money, cards, and photos? Questions in the Bible version include: What is your favorite Bible verse? What person from the Bible would you most like to meet and why? If you could insert yourself into any story of the Bible, what would you choose? What is one book of the Bible you would like to learn more about? Which person from the Bible do you most admire and why? What is your favorite book of the Bible? Click on links below to open the free PDF files. and in the instructions to, so ya!